Evangelist lost 12-year-old daughter to killers last year. NAIROBI, Kenya (Morning Star News) – Twice in the past two weeks, Muslim extremists in eastern Uganda have tried to kill a former sheikh known throughout the region for his Christian activities, the former Islamic teacher told Morning Star News. Hassan Muwanguzi, an evangelist in Budaka District whose conversion and ministry success led hard-line Muslims to poison him and kill his 12-year-old daughter last year, said he received a phone call in late June from a Pallisa District resident, 40-year-old Naaya Edward. 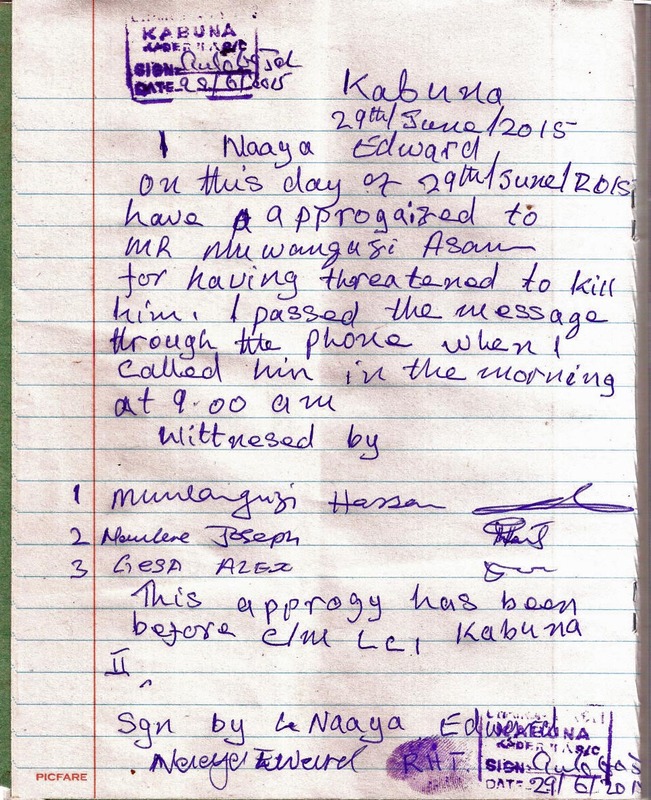 The caller said he had been given a message to deliver to Muwanguzi. When they met Edward on June 29, he appeared very nervous, he said. 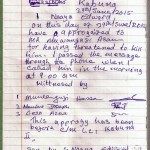 The village elders released the man after securing written notice that he had apologized to Muwanguzi for threatening to kill him. Morning Star News has obtained a copy of the notice. A second attempt on his life took place three days later, he said. On July 2 a group of Muslims broke into Muwanguzi’s house at 10 p.m. and stole hundreds of dollars’ worth of personal belongings while he and his family were away at a prayer meeting. Neighbors who tried to intervene said the intruders were armed with knives and clubs and threatened to kill the evangelist. The intruders took Muwanguzi’s computer, television and a radio. He has reported the incident to Budaka police, who are investigating. On June 16, 2014, four Muslims who sought to kill him and were unable instead strangled his 12-year-old daughter, Grace Baruka at their home then in Katira, outside Mbale in eastern Uganda. At the end of March last year, Muslim relatives allegedly poisoned Muwanguzi by putting insecticide in his tea at a family gathering in Kadimukoli village, Budaka District. Uganda’s population is 85 percent Christian and 11 percent Muslim. The country’s constitution and other laws provide for religious freedom, including the right to propagate one’s faith and convert from one faith to another. Muwanguzi has faced violence since he put his faith in Christ in his early 20s in 2003. His family immediately kicked him out of their home, and enraged Muslims beat him, he said. His wife left him that same year, and he lost his job as a teacher at Nankodo Islamic School, near Pallisa. He opened a Christian school, Grace International Nursery and Primary School, at Kajoko, Kibuku District, 27 kilometers (16 miles) from Mbale; the area’s population of 5,000 people is predominantly Muslim. Incensed by his boldness, an Islamic teacher, sheikh Hassan Abdalla, in 2011 filed a false charge that Muwanguzi had “defiled” his daughter, a minor. 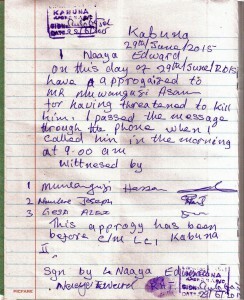 Abdalla and other hard-line Muslims filed a case at the chief magistrate’s court in Pallisa-Kalaki, and a warrant for Muwanguzi’s arrest was issued on April 1, 2011. Muwanguzi was arrested and released on bail after nearly a month. He said the Muslims filed the false charges because he had opened the Christian school against the wishes of the Muslim majority. More than a quarter of the school’s 235 children came from Muslim homes, with the consent of their Muslim parents, he said. Area Muslims resorted to witchcraft to try to get him to close down the school, and when that didn’t work, they tried to discourage parents from bringing their children to the school, accusing it of converting Muslim children to Christianity by teaching Christian Religious Education, he said. When his accuser failed to appear in court on multiple occasions, the judge finally found the accusations were false and dropped the case in May 2012, he said. A few weeks after he was acquitted, the owner of the land denied having sold it to Muwanguzi, and he received a court order to close down the school. In June 2012, he said, Muslim sheikhs, imams and relatives burned down his house for having converted to Christianity. Since his wife left him for embracing Christianity, Muwanguzi has remarried and has three surviving children.